You’re not beautiful or fancy or German-engineered. My mother-in-law only had you because the City gave you away for free. But composter, you do a thing of beauty. You accept all of our food scraps without judgment and ease my conscience about the rotten fruit I find in the back of the fridge. You swallow paper plates, popsicle sticks, and unwanted flyers. You saw us through the garbage strike of ’08 and turned us into some of the only folks on the block who didn’t have to go to the dump every week. I never realized how much you would do for me, and how little you would ask in return. This spring I feared I had neglected you too long – your contents looked compacted and I wasn’t convinced they had actually broken down – but as I turned the soil and waited to be confronted with evidence of last year’s waste, I found… soil. Just soil, with maybe a few corn cobs (they just take forever to break down, don’t they?) and the printed edge of a Chinet plate as evidence of its origins. I was elated. You work! I throw rotten food into you and you give me back beautiful, nutrient-rich soil! For FREE! Stick with me, baby. As of tonight, I’m not gonna feed the city’s green bin any more than absolutely necessary (I know you don’t do diapers). I’m gonna start feeding you again, and we’ll make beautiful dirt together. I noticed today that the snap peas have sprouted and are starting to grow, and that the potatoes need another layer of soil poured on them. I can’t wait to see everything growing! Everything except the weeds, that is. Next time: pics of my beautiful spring bulbs and the new fruit trees! I have to say, I love it when I get an intelligent and genuinely helpful customer service representative. Backstory: last year we bought a cordless lawnmower on Craigslist. It worked for a few months, then started covering progressively less ground until one day it just wouldn’t start. We suspected a new battery was in order. I called B&D today. After getting redirected a few times, I finally spoke to someone at their office who told me that a new battery would cost $227.72. 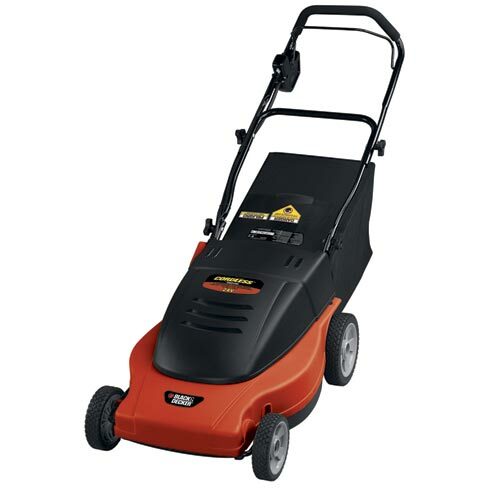 After my exclamation of “wow”, she pointed out that for $220 I can bring the lawnmower to them and they’ll service it, get the whole thing running like new including any inoperative parts. Wow! Looks like one of us is making the trek to Mississauga tomorrow so that we can finally start cutting our lawn. Thanks, helpful Black & Decker employee! Yes, I’m one of those people. On Thursday morning we planted N’s placenta under our new peach tree. (and yes, it’s been in our freezer for over ten months.) A close friend was on hand to witness it, and she was completely grossed out. I wasn’t at all. Then while filling in the hole I saw a fabulously fat, juicy worm. I’m fascinated by earthworms and gratified to know that our soil is good enough to have hundreds of worms in one small patch of earth. Anyhow, this worm was on top of the pile of dirt and needed to get back in the ground. Well, when she put it like that, it did sound silly. And so I picked up the worm – it was pretty neat, actually, soft and alive but not slimy at all – and put him back into the ground under the placenta tree.